Stylish sterling silver jewellery by British designer Kit Heath. Official stockists of Kit Heath Jewellery in the UK. Kit Heath has been producing high quality sterling silver jewellery for more than 30 years. Gold bumblebee stud earrings from Kit Heath&apos;s Blossom Collection, measuring 8 x 13mm. Kit Heath jewellery is made in solid sterling silver with 18ct gold plate and each piece is rhodium plated to prevent tarnishing and ensure long lasting beauty. Supplied in a deluxe Kit Heath presentation box. Galaxy stud earrings from Kit Heath&apos;s Stargazer Collection, measuring 12 x 7mm. Kit Heath jewellery is made in solid sterling silver and each piece is rhodium plated to prevent tarnishing and ensure long lasting beauty. Supplied in a deluxe Kit Heath presentation box. Pebble amethyst large stud earrings from Kit Heath&apos;s Coast Collection, measuring 10 x 8mm. Kit Heath jewellery is made in solid sterling silver and each piece is rhodium plated to prevent tarnishing and ensure long lasting beauty. Supplied in a deluxe Kit Heath presentation box. Novo disc drop earrings from Kit Heath&apos;s Stargazer Collection, measuring 39 x 23mm. Kit Heath jewellery is made in solid sterling silver and each piece is rhodium plated to prevent tarnishing and ensure long lasting beauty. Supplied in a deluxe Kit Heath presentation box. Eden small leaf hoop drop earrings from Kit Heath&apos;s Blossom Collection, measuring 29 x 5mm. Kit Heath jewellery is made in solid sterling silver and each piece is rhodium plated to prevent tarnishing and ensure long lasting beauty. Supplied in a deluxe Kit Heath presentation box. Gold bumblebee pendant from Kit Heath&apos;s Blossom Collection, measuring 15 x 20mm. Supplied on a 16 to 18 inch extender chain. Kit Heath jewellery is made in solid sterling silver with 18ct gold plate and each piece is rhodium plated to prevent tarnishing and ensure long lasting beauty. Supplied in a deluxe Kit Heath presentation box. 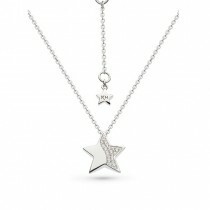 Sparkle CZ super star pendant from Kit Heath&apos;s Miniature Collection, measuring 20 x 19mm. Supplied on an 18 to 20 inch chain. Kit Heath jewellery is made in solid sterling silver and set with cubic zirconia, also each piece is rhodium plated to prevent tarnishing and ensure long lasting beauty. Supplied in a deluxe Kit Heath presentation box. Sparkle CZ mini moon pendant from Kit Heath&apos;s Miniature Collection, measuring 13 x 12mm. Supplied on a 17 inch chain. Kit Heath jewellery is made in solid sterling silver and set with cubic zirconia, also each piece is rhodium plated to prevent tarnishing and ensure long lasting beauty. Supplied in a deluxe Kit Heath presentation box. Flourish large twist pendant from Kit Heath&apos;s Coast Collection, measuring 200 x 15.7mm. Supplied on a 16 inch chain. Kit Heath jewellery is made in solid sterling silver and each piece is rhodium plated to prevent tarnishing and ensure long lasting beauty. Supplied in a deluxe Kit Heath presentation box. Galaxy micro cluster pendant from Kit Heath&apos;s Stargazer Collection, measuring 30 x 9mm. Supplied on a 16 to 18 inch chain. Kit Heath jewellery is made in solid sterling silver and each piece is rhodium plated to prevent tarnishing and ensure long lasting beauty. Supplied in a deluxe Kit Heath presentation box. Novo disc pendant from Kit Heath&apos;s Stargazer Collection, measuring 30 x 23mm. Supplied on a 16 to 18 inch chain. Kit Heath jewellery is made in solid sterling silver and each piece is rhodium plated to prevent tarnishing and ensure long lasting beauty. Supplied in a deluxe Kit Heath presentation box. 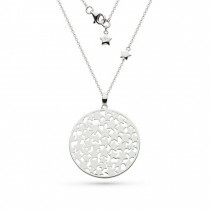 Novo grande disc pendant from Kit Heath&apos;s Stargazer Collection, measuring 40 x 32mm. Supplied on a 28 inch chain. Kit Heath jewellery is made in solid sterling silver and each piece is rhodium plated to prevent tarnishing and ensure long lasting beauty. Supplied in a deluxe Kit Heath presentation box. Eden leaf link 7.5 inch bracelet from Kit Heath&apos;s Blossom Collection, measuring 1.5 x 90mm. Kit Heath jewellery is made in solid sterling silver and each piece is rhodium plated to prevent tarnishing and ensure long lasting beauty. Supplied in a deluxe Kit Heath presentation box. Kit Heath silver Japanese blossom inspired cuff bangle. Kit Heath gift box and bag included. Matching items available. Classic studs for any occasion. Sterling silver round bezel set blue topaz stud earrings from Kit Heath&apos;s Simmer collection. Post and scroll fittings. All Kit Heath jewellery comes in a presentation box.